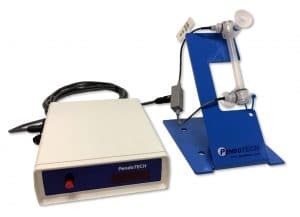 PendoTECH, USA have recently added a range of four LEVIFLOW® single-use ultrasonic flowmeters to their sensor product line. The flowmeter uses ultrasonic transit time, flow techniques to provide an obstruction free flow path, with no moving parts. The flowmeters find many different applications in the biopharm industry, including TFF filtrate flow, Normal flow/depth filtration and Chromatography. 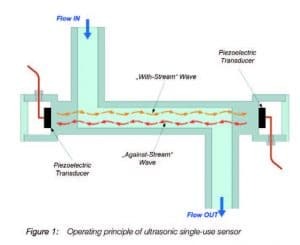 Figure 1 illustrates the operating principle of the ultrasonic flowmeter. operating principle of the ultrasonic flowmeter. Two piezoelectric transducers, mounted in the sensor housing, generate and receive an ultrasonic wave. The wave going in direction of the flow (with-stream wave) is accelerated and the wave going against the flow direction (against-stream wave) is slowed down. The two waves are processed by the PendoTECH Leviflow® Sensor Monitor. The difference of the transit time of both waves is proportional to the velocity of the fluid. The monitor has a digital LED display for the flow reading. It also has both a 4-20mA analogue output and a digital frequency output. These outputs facilitate interface of the monitor to other systems for process control and data acquisition. 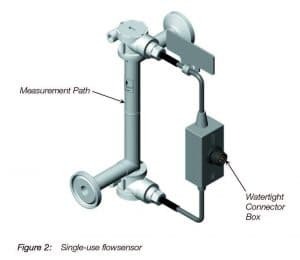 The standard configuration of the LEVIFLOW single-use flowmeters (Figure 2) consists of a flow sensor and the PendoTECH LEVIFLOW Sensor Monitor with a digital signal processor (DSP) for processing the sensor signals. Flow sensor can be used as single use to prevent cross-contamination or re-used. The sensors are available in 4 different flow ranges to cover the majority of biopharm applications in process development and pilot plant. Full scale of 0.8 lpm, 8.0 lpm, 20 lpm and 80 lpm, with a typical accuracy of +/- 1% (see data sheet for full details).